The square, situated on the south of Musei street, is entitled to Tebaldo Brusato, leader of Guelphs in Brescia who, in 1311, stood opposite to the invasion of Enrico VII, king of Germans, and sacrificed himself because he did not want to declare the capitulation of the city. Text: in the medieval era, the square hosted the cultivated fields of the near cloister of Saint Giulia, and since 1173 it became the first public square in the city that could sell, and for this reason it was initially called “New Market”. Near there, many shops of merchants and artisans were built. During the years, it was not only a place for selling, but also house for aristocratic families were built, such as Cigola Palace, today Fenaroli Palace, Luzzago and Suardi Palaces. 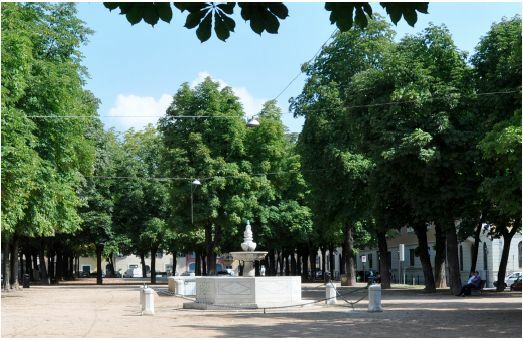 The name of the square changed in Tebaldo Brusato in honour of the leader of Guelphs who sacrificed himself not to leave the city under the control of Enrico VII, king of Germans. On the south-east of the square there is the archaeological site of the domus of Alberto Mario street, dug in the 80s, and not available for visits. 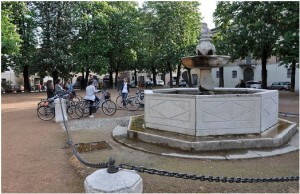 The fountain in the square, when it was built in the sixteenth century, was put at the back of the Loggia Palace, and in 1853 was moved to Pescherie Nuove square, where it stayed until 1930, when the Pescherie quarter was demolished to build Vittoria Square. In that year the fountain was put in Tebaldo Brusato Square. In the modern era, the square was used as a car park, but in recent years, interventions of requalification were made and the square returned to be a meeting place. 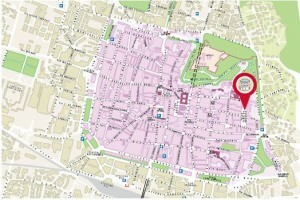 Today the square is a place for sociality and night life, in addition it hosts the Antiques Market and the Bio-Market organized by the association La Buona Terra.